Shift towards more environmentally-friendly materials, for example, the use of water-borne rather than solvent-borne chemicals. heat resistance, increased durability, and enhanced appearance to the wood surface. Finishing also helps in keeping the end product sanitized and easier to maintain. and mainly focus on aesthetic appeal. industry is also fueling growth of the wood coatings market. coatings may fade over time making the damage areas look yellowish. 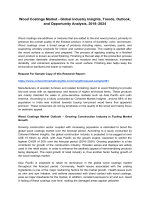 N.V., Premium Coatings and Chemicals Pvt Ltd. And Nippon Paint Co. Ltd.